General rubbish consists of clutter, junk, rubbish overflow and what the council won’t pick-up. Is your garage or spare room filled with a clutter you’ve been hanging on to for far too long? Industrial waste is renovation materials, builders waste & construction rubble. Is your construction site in a big mess and you don’t have time to fill your skip bins? 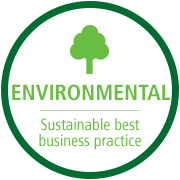 Commercial services include contracting, office strip outs and e-waste recycling. Do you need someone to take care of left over furniture from your old office space? 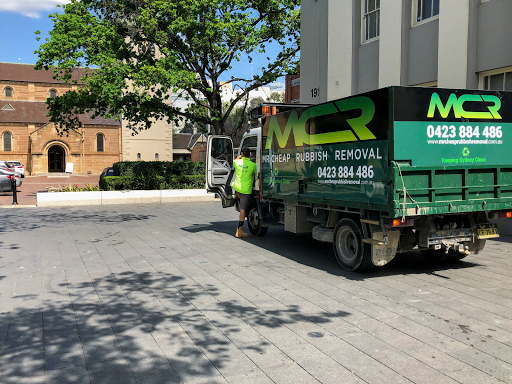 We are Mr Cheap Rubbish Removal and we provide rubbish removal services for home, business, or industrial – we do not pickup medical waste or bio-hazardous materials. We’re a small family-owned business based in Sydney, NSW. As an independent business, we understand the importance of being involved with different Sydney communities. That’s why we believe in supporting causes like Clean Up Australia Day. We are 100% committed to keeping Sydney clean. This is so important to us that we even have ‘Keeping Sydney Clean’ written on our trucks. For more information the company please see our about page. If you’re looking for pricing information to see how cheap we are, please check the pricing page. We leave industrial job sites squeaky clean just so you can concentrate on keeping your workflow productive! Remember, though: Just because we’re affordable, doesn’t mean you’ll get second-rate service from us. We pride ourselves on our blend of professionalism and friendliness. Our workers are polite, hard-working, and are fantastic at finding parking in Sydney’s busy traffic: we can use loading zones. We’ll pick up your garbage as soon as we can, then dispose of it in the appropriate manner – and we’ll do it at a price that’s so affordable that it’ll have you wondering why you’ve never used us before. 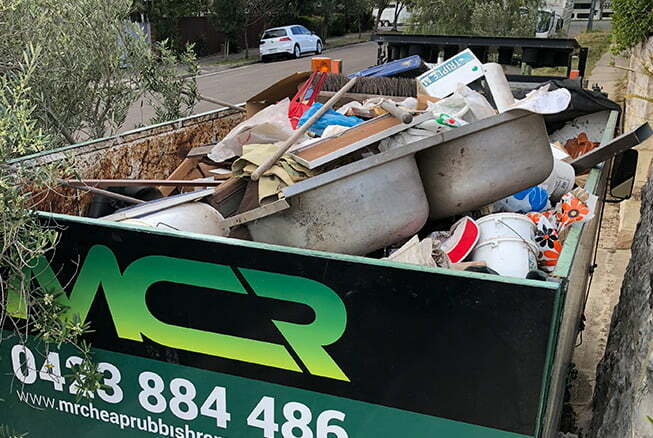 Whether you need some rubbish removed quick smart or are interested in finally having the home renovated and can’t afford a skip-bin, Mr Cheap Rubbish Removal will have it removed it quicker and cheaper than anyone else. Call us or fill in the contact form to receive your obligation free quote, we will ask a few questions regarding how much work load is required, and then we book a time that is convenient for you. Our uniformed team members will arrive, on time, measure the load of rubbish and provide a final quote. Our guys will load the truck and deliver it to the recycling centre, tip or landfill. All our pricing includes a tip fee and EPA charges. 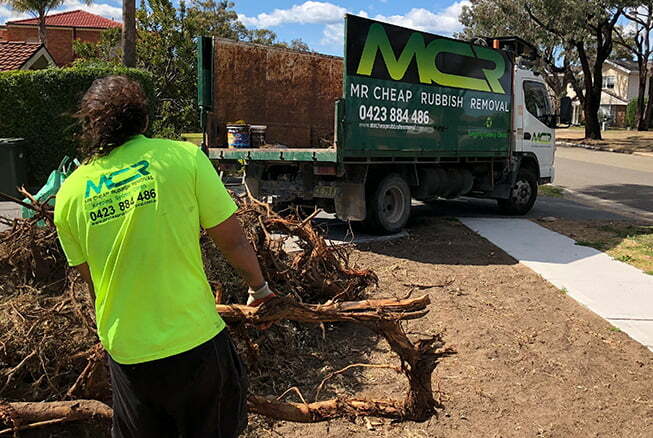 Mr Cheap Rubbish Removal cares about the environment and providing a good service in Sydney that’s affordable: we will take care of everything for you. 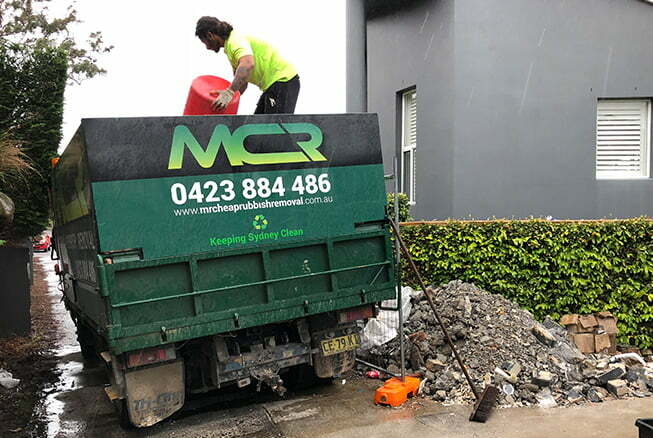 Mr Cheap Rubbish Removal offers the cheapest waste removal services; we cover most of Sydney for household, commercial and builders waste. See our serviced locations page to double check – or call for a free quote. In fact, we’re even cheaper than skip and bin hire in the majority of cases and when you choose us, you don’t have to do any of the heavy lifting, disposal or clean-up. We take care of it all for you! Call today on 0423 884 486 or fill out our form and we’ll get in touch. What kind of rubbish do you take? 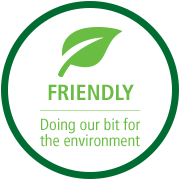 We take most rubbish types such as: household, furniture, deceased estate clean up, brick and concrete, timber and gyprocks, mattresses, white goods, fridge and washing machine etc. 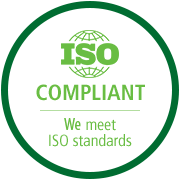 We do not take: paint, flammable, asbestos contaminated material, medical waste. We charge most of the rubbish per cubic meter, from $80-$150/Cubic meter, please go to (price page) for more details. We do take cash and all major cards (Visa, Mastercard, Amex) with our mobile eftpos machine in our truck. Do I need to be home for collection? No you don’t need to be, provided we have access to where the rubbish is located, it should be fine. What happens to my rubbish and where do you take it to? 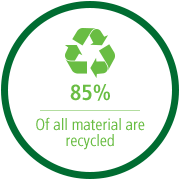 All your waste will be taken to recycling centre, it will be recycled and disposed of following NSW waste regulations and EPA. I'd like to go ahead, what's next? Call or email us to make a booking that suits you, and our 2 man team will come to your premise to remove your junk. There are many options for removing rubbish from your home, and in most cases the council will provide the service for free (with high restrictions and rules) however more often than not the your local council won’t pick up your rubbish on time, they will leave behind what they’re not allowed to take, and if you’ve moved or left it there you could even be fined. Mr Cheap Rubbish Removal takes away all the stress of extra costs and leaves your wit peace of mind that the job will be completed as requested. We have provided Sydney with a solution that keeps Sydney clean, and we plan to maintain this for many more years to come. If you want to support family businesses, please call Mr Cheap Rubbish Removal, we’ll look after you.